Thanks for all the kind remarks and hellos after being away from the blog-o-sphere for so long, it was good to hear from all of you. Things are finally heating up in the world of film projects, as I mentioned in my last blog, as many scripts that were once simmering on back burners, are suddenly coming to a full boil again, including: THE WHITE, ALCATRAZ, THE WATCH and of course the big screen adaptation of my partner Del Howison's anthology series DARK DELICACIES: THE MOVIE. Even JEEPERS THREEPERS is again having the heat turned up on it, with the added caveat of perhaps doing the third installment of the Creeper trilogy in 3D. 3D is all the rage again, and you are all turning out in droves to see it. So, expect more 3D titles in the near future and maybe even your favorite feaster of 23 years to maybe come out of the screen at you, as well. More as details continue to develop. 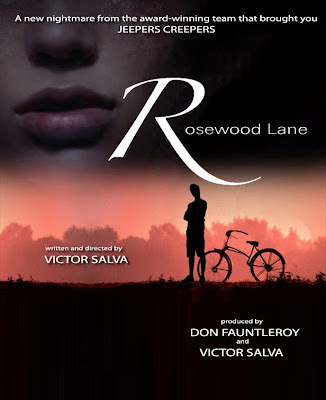 But, the first show out of the gate this year, as I mentioned in my last entry, is a script I have long awaited to put up on the big screen: ROSEWOOD LANE. We are now in what is called preproduction on Rosewood. For those who don't know specifically, this is a vital stage of moviemaking that prepares everyone for the actual shooting of the film. "Prep" as it's called, includes all manner of getting your movie ducks in a row: location scouting (and deciding where to shoot to begin with) casting, costuming, storyboarding, set building, putting together camera and make-up crews, even rehearsals if there is time allowed -- and I always try and make time). Basically prep is getting your little army together to go out and shoot this thing. The team coming together for ROSEWOOD LANE are many of the same terrific people that brought you both JEEPERS films. My suburban thriller that stars Gina Philips, who I am so happy to be reunited with after our wonderful collaboration on JEEPERS CREEPERS, also includes from the Jeepers team: Production Designer Steven Legler, my editor Ed Marx, my make-up effects wizards at Make-up and Monsters, my wonderful stunt coordinator from Jeepers II, my multi-gifted partner and cinematographer Don Fauntleroy, and my brilliant composer Bennett Salvay. There isn't a team of people I'd feel better about going into battle with on any film, than these terrific people. 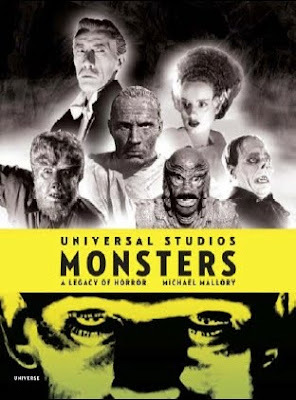 As the train starts to leave the station for ROSEWOOD LANE, I have had the best time reading one of my Christmas gifts this year, the big coffee table book called UNIVERSAL STUDIOS MONSTERS. It's a great ride back to the start of Universal studios and how the horror genre became their bread and butter back in the great days of Hollywood. The pictures alone are worth the price of the book, if you are in fact as big a fan of the old Universal black and whites as I am. For me, these were the films that started me off on my love affair with the horror genre, so it is especially terrific to read about them all again, this time as an adult (some would argue) here in this terrific book. It really made me break out all my DVDs of the Universal Horror Hey Days! Over the holiday break I took out all the houses of Dracula, and all the ghosts and sons and returns of Frankenstein and had a week long festival of black and white horror fun. 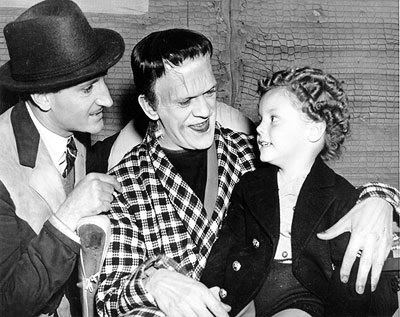 My favorite Frankenstein film, and it always was, was SON OF FRANKENSTEIN, where Basil Rathbone played Victor von Frankenstein's son, Frederick. Freddie returns to the village of Frankenstein with his wife and his own young son Peter, to a cold family castle and the unwelcoming villagers who still remember the horrible monster that stalked the countryside. 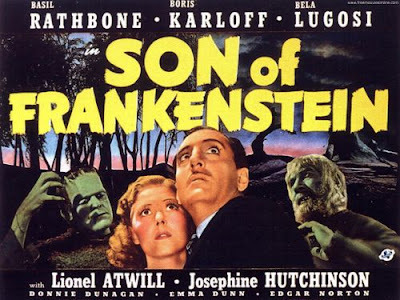 To me, the film is a standout for many reasons: the fantastic and massive sets that look like no other Universal horror film (with the possible exception of the Wolfman's great sets for the Talbot estate) the creepy story of the Frankenstein monster moving about the massive estate at night through secret passageways -- and befriending small Peter Von Frankenstein, "A giant came into my room last night, daddy…"
Another distinguishing factor in the film, was a performance by Bela Lugosi as Ygor, a man hanged for grave robbing but after surviving his execution, haunts old castle Frankenstein with a broken neck and a gravely voice. Lugosi really showed he had range in this film, and the part is ever so juicy. 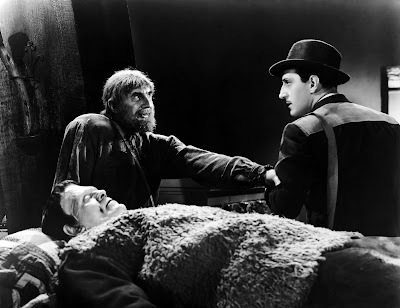 Ygor has befriended the Frankenstein monster (still alive of course) and has been using him to kill off the jurors who sentenced him to death. Add to Bela, just a great supporting cast. 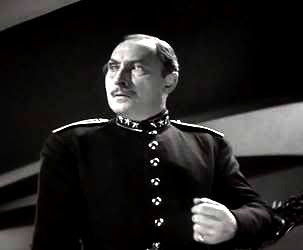 Including Lionel Atwill as the village chief of police, with an artificial arm --the monster ripped it off him when he was just a boy. 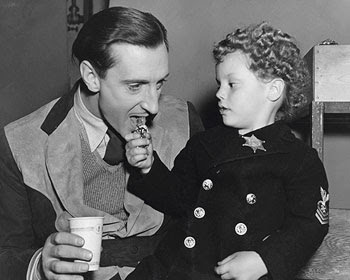 Mr. Rathbone -- is that about the greatest name an actor could have or what: Basil Rathbone -- Basil played the son of Colin Clive's Victor Von Frankenstein from the original film and is suddenly obsessed with his father's work, when he discovers that the creature still lives and may be immortal. As my Christmas present book points out, Basil does an atypical over the top, one might even say hammy job of portraying Dr. Frankenstein Jr. The book suggests it might be because Rathbone was quite derisive when it came to horror films and didn't want to appear in this one. That gives the film an even more interesting dimension -- Rathbone does seem to be throwing a tantrum through most of the film -- like a petulant child unhappy with having to be where he is. Whatever the reason for him hitting all the dramatic notes in Son of Frankenstein so hard -- I never seemed to notice or care as a boy. It was always my favorite of the Frankenstein films. The book has terrific bios of the horror greats of the time, including Bela Lugosi, who was somewhat of a victim of his own success, he played Dracula so well. Dracula was a part he had played on stage and actively campaigned to play in the film version, but then, after the film's great success, found it hard to be considered for anything other than horror roles. 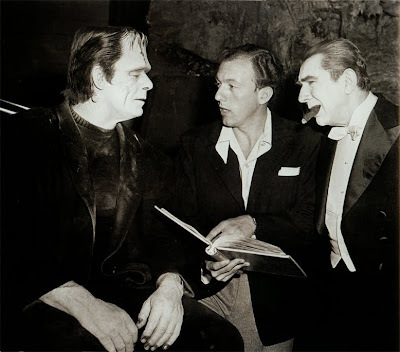 As the biggest horror star in the world -- with the smashing success of Dracula -- Lugosi then turned down the part of Frankenstein when Universal offered it to him. 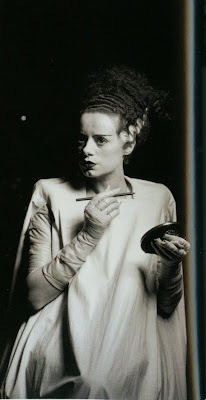 When their main horror attraction said no to all that make-up, and to a part with almost no dialog at all, they were forced to look elsewhere -- and came upon a lowly bit part player named Boris Karloff and the rest was history. The book points out that after that, Lugosi never turned down a role. 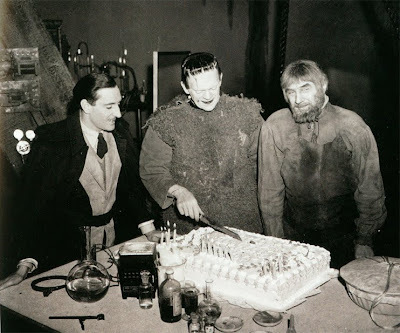 Feeling like he had truly missed out on being the sensation that was Frankenstein, and being in a film that propelled Karloff to equal horror-superstar status at the same studio. 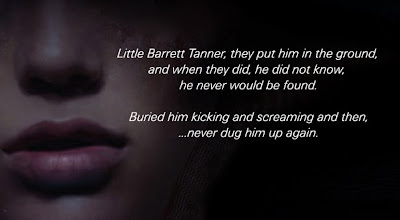 The book is full of interesting tidbits like that one, and I have to tip my hat to the wonderful job Michael Mallory did in putting it all together so handsomely. 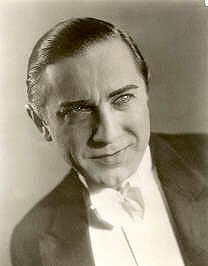 The chapter on Lugosi goes on to reveal that Bela was a classically trained actor, and in the prestigious Hungarian National Theater had played everything from Romeo to Jesus Christ. There are also tidbits of stuff that I did not know and was thrilled to find out, for instance did you know that the most popular Universal movie monster of the 40's wasn't Dracula or Frankenstein -- but the Wolfman. Which is why Lon Chaney Jr.'s Larry Talbot is often at the center of so many sequels from that era, and the monster and the vampire, supporting characters? As a kid, the Wolfman wasn't my favorite, but as I wrote into my screenplay for CLOWNHOUSE -- he was always the monster who scared me the most. If you, like me, thrill to stills and photos from films like these, do I what I do, go to a website called "Dr. Macro's High Quality Movie Scans", this terrific site has all kinds of beautiful stills from horror of that era (and films of all kinds) for desktops or whatever. All this praise and I haven't even gotten to the chapter about my favorite Universal film Abbott and Costello Meet Frankenstein, or the chapter about my favorite Universal guy of all time: THE CREATURE FROM THE BLACK LAGOON, but I'm looking forward to it. Again, as prep heats up on ROSEWOOD LANE, I will try and keep all interested parties in the loop, but things tend to get a little chaotic, exhausting and 24/7 as a picture goes into active preproduction. But it is a chaos I welcome gladly.